For today’s deal roundup, we have found some exciting deals on Flipkart on power banks, which are from brands like Ambrane, Intex, Mi and more. 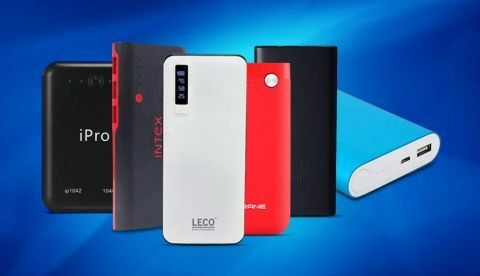 If you often run out of your smartphone battery especially when you’re traveling outside then buying a power bank is a pretty good option as it can be carried anywhere easily to charge your smartphone on the go. Today, Flipkart is offering a hefty discount on power banks, which are from manufacturers like Ambrane, Intex, Mi and more. So, let’s take a look at the deals that are going on the platform today. The Ambrane 10000mAh Power Bank features a dual USB port that can charge up to two smartphones simultaneously. It also has a USB Type-c port that can be used for charging power bank quickly. The device is available on Flipkart at a discounted price of Rs 899. Check out the deal here. The Intex 12500mAh Power Bank is available on Flipkart at a price of Rs 799 down from its MRP of Rs 2,100. The device comes with three USB ports that let you charge multiple devices at once. Check out the deal here. The Mi 10000mAh Power Bank comes with two USB ports that can charge up to two devices simultaneously. The power bank also has Low Power mode, which can be used for charging devices such as headphones, speakers and more. Currently, the device is available on Flipkart at a discounted price of Rs 899. Check out the deal here. The Leco 15000mAh Power Bank has a total number of three USB ports, which can charge up to three devices simultaneously. Today, on Flipkart the device is available at a discounted price of Rs 599. Check out the deal here. The Ipro 10400mAh Power Bank features a dual USB port and an LED indicator that lets you know about the charging status of your device. The power bank is available in four colors Red, Blue, Black, and White. For today, the device is available in Flipkart for Rs 599. Check out the deal here.